How would the experience of using London’s hire-bikes differ if they were connected to the network? Named for the genus of the pigeon – known for both its homing abilities and its prevalence throughout London – Columba is a working experience prototype in hardware and software that explores this idea. Most hire-bike users have an idea where they’re planning to ride their bike: they either know the route already, or know it as a pedestrian and can derive a cycle route from that. The hardest element of using a hire bike is knowing where to park it. Riders tend to aim for their destination – and once at their destination, only then look for the nearest docking station to park in. Docking station locations aren’t always obvious. A plethora of mobile apps make it easier to locate the nearest docking station. But a civic, low-cost transit solution shouldn’t demand a smartphone to make it complete. The data the many apps use is already collected by Transport For London and supplied freely to developers. What if that data was made available through the bike itself? How would using the bike change if it was turned into a connected object? Columba sits on the stem of a hire bike, between the handlebars. a ring of lights acts as a compass – not pointing north, but always points towards the nearest docking station with empty racks. As you near a station, the compass-point gets wider, much like the UI in a computer game. If a new station has become closer, the ring pulses green to indicate its ‘lock-on’ has changed. Prototypes can test a variety of things: what an object should look like; how an object should work; how reliable technology is; if particular data is enough. Columba is an experience prototype: the purpose is to see what it feels like, to validate the idea, and learn enough to make informed future decisions or opinions. It is fully functional, using real data from TFL, but its implementation is nowhere near final, and aesthetics have very little consideration in its current form. a web-based Ruby on Rails application. This collects TFL’s bike hire data, stores it in a PostGIS database, and serves up the nearest docking stations to locations. It also serves as a web-based prototype front-end, so that Columba can be tested on a smartphone. a hardware device. This is based on two stacks: an Electric Imp to connect to the network, and request and retrieve data from the Rails webservice. It receives JSON from the webservice, and formats it prior to passing it over UART to an Arduino. 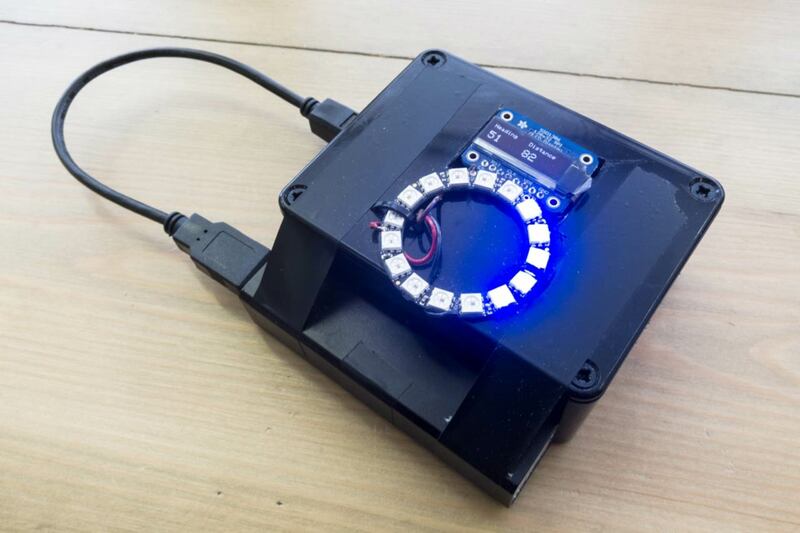 The Arduino handles translating that data into the appropriate lighting on a NeoPixel ring, and also displaying information on an OLED screen that’s used for debugging. 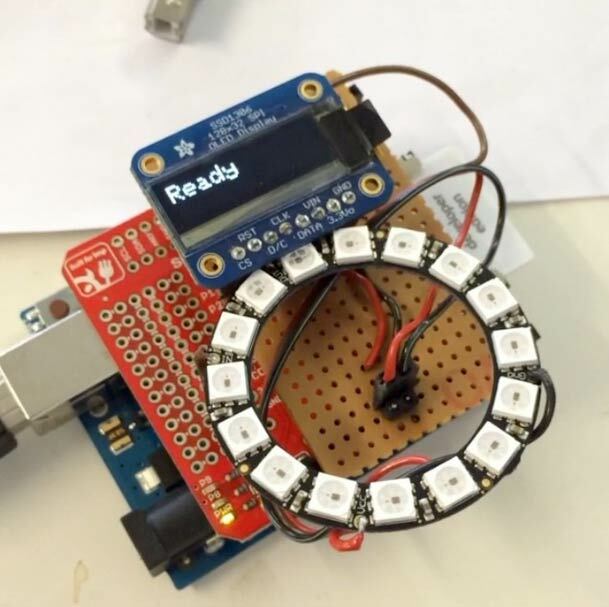 The hardware object is entirely battery powered, from a rechargeable 5V LiPo battery. The prototype in process of being built. For the purposes of the prototype, network connectivity is supplied by bridging the Imp to a smartphone’s wireless hotspot, and location data is pushed from the phone via the webapp to a PostGIS database. These are the two most obvious compromises in getting to a working prototype, but the purpose is not to prove how a 3G modem works: it’s to see if Columba is a worthwhile addition to the bike. The prototype serves to explore the changes in habits and interactions when data is manifested in the surface of the objects it represents. The bike becomes a service avatar for the bike-hire system: it becomes more useful, and more honest, by dint of connecting it to the network. It removes the need for a smartphone app to make the service useful. It’s easy to read, providing a simple piece of information and relying on the rider to route themselves in that direction. And, for the majority of a journey, it’s entirely ignorable. 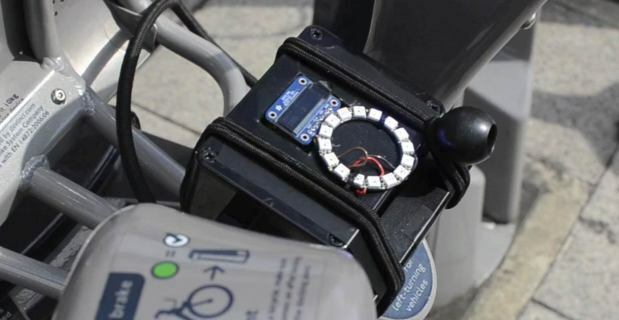 This prototype is currently a prosthesis, attached to a bike with a pair of bungee cords, but it’s easy to imagine what an integrated solution could be like: integrated into the stem boss of the bike itself, with an integral 3G modem, GPS and magnetometer to provide location and heading information, along with a network connection. Power would have to be supplied by an internal battery, perhaps a dynamo. It feels unrealistic just to sketch or render an imaginary object, though. Far more useful to explore the conceit in working form, to see if the interaction has value. Columba was built to demonstrate the value of civic connected objects. A lot of the rhetoric around the Internet Of Things focuses on consumer objects, which are frequently luxury or high-end goods. However, in cities, it’s likely shared civic objects that will be the connected objects most people interact with. The London bus timetable, for instance, is a network-connected device that manifests data: the timetable derived not only from expectations, but also realtime location data from buses in motion. Columba explores the potential for other civic connected objects: using the network, and existing data, to improve the usage of the city. It is a continuation some of the ideas within Hello Lamppost – what connecting existing objects and infrastructure the network in simple, humane ways does for the people who use and interact with them. Columba only exists in prototype form, although you can use the web-based prototype on your smartphone at bikecompass.tomarmitage.com. If you’re interested in exploring the design or construction of connected objects and their systems, do get in touch. Columba was also known by the codename Hutton during its development.